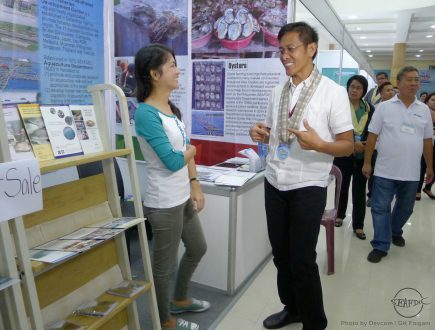 Aquaculture technologies developed by SEAFDEC/AQD were presented to the public through a booth during the 1st National Aquaculture Summit held 7-8 July at Leisure Coast Resort in Dagupan City. The booth displayed and distributed various publications including farmer-friendly manuals, textbooks, and brochures which are outputs of the R&D work in SEAFDEC/AQD. 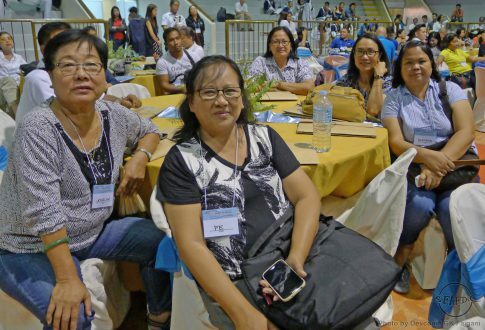 The two-day summit organized by the Philippine Association of Fish Producers, Inc. (PAFPI) in collaboration with the Bureau of Fisheries and Aquatic Resources (BFAR) was attended by SEAFDEC/AQD Technology Verification and Demonstration Head Dr. Fe Dolores Estepa, Scientists Dr. Mae Catacutan and Dr. Eleonor Tendencia, Associate Scientist Ms. Jocelyn Ladja and Researcher Ms. Gregoria Pagador. Among the topics discussed in the summit include status, trends, opportunities and challenges in the aquaculture subsector including the impacts of the ASEAN integration to the Philippine aquaculture commodities trade.